Fit One is a fitness and wellness facility that works as part of the community to help individuals, families and children to apply principles of a healthy lifestyle through fitness programs and nutritional education within a safe and caring environment for all persons while promoting good health ethics through Christian values. Focused on customer service, Fit One offers all the benefits of chain gyms without the side effect of being lost in the crowd. 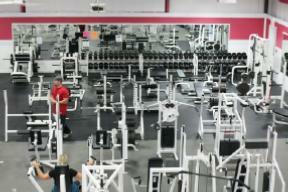 Our 15,000 sq. ft. facility is equipped with premium exercise equipment by Cybex®, Life Fitness®, and Stair Master®. We offer several group classes to cater to your needs and schedule but If it's more of a one on one experience you are seeking, our certified personal trainers will work with you individually to ensure that your fitness goals are met. Take a few moments to check out what we have to offer. Contact us with any questions or drop by our facility and our friendly staff will give you quick tour with no pressure or obligation. Read some of our members' success stories! © 2008-2020 Fit One Gym. All rights reserved.